Nicolas Perrot was a great explorer. Although he gave four governors of New France ample proof of his talents as a negotiator and diplomat, they did not hesitate to send him back to his lands, and to a poverty due in part to his own lack of self-interest. Born in France between 1641 and 1644, perhaps in Darcey, in Burgundy, where his father was a lieutenant of justice, Nicolas Perrot was raised by the Jesuits. This, at least, is what we are led to suppose in view of his erudition, his writings and the context of his arrival in Canada, where we see him already in 1660 as an interpreter and donné with the Jesuits. According to Father François-Xavier de Charlevoix, Nicolas Perrot was “a bright young man of good family who had had some education “. The same author noted that “financial necessity had obliged Perrot to put himself in the service of the Jesuits “. Nicolas Perrot followed his masters in the region of the Baie des Puants (Green Bay), becoming one of the first Frenchmen to come into contact with the tribes west of the Great Lakes and in particular with those of the present-day state of Wisconsin. When he stayed with the Pouteouatamis of Lake Michigan, in 1665, he had already been freed from his engagement with the Jesuits for some time. He traded furs for guns, allowing this group to defend itself on equal terms against enemies who had been taking advantage of them. Nicknamed the “iron trade”, this exchange won him the friendship of the chief, who venerated him like a god. In a few months, he strengthened the ties established during earlier travels. Perrot returned to Ville-Marie the same year. The experience had not made him a wealthy man, since he worked as a servant for the widow of Jacques Testard before entering into the service of the Sulpicians. 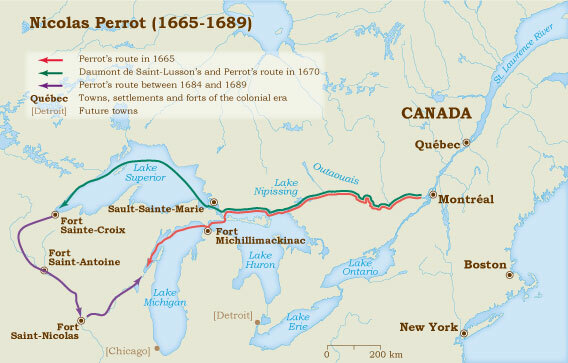 As an associate in a trading company he formed with three Montreal colonists, on August 12, 1667, Perrot returned to the Baie des Puants. Once again, the ties he established were more profitable than the furs he brought back. Although poor, Nicolas Perrot had a good enough reputation for the intendant Jean Talon to appoint him interpreter for Simon-François Daumont de Saint-Lusson in September 1670. Daumont de Saint-Lusson was to seek “copper mines in the lands of the Outaouais, Nez-Percés, Illinois and other nations discovered or to be discovered in Septentrional America in the region of Lake Superior or the inland sea ” and to inquire “attentively as to the existence of a passage via lakes and rivers with the southern sea, separating the continent from China “. Two months later, Robert Cavelier de La Salle would be sent towards the southern sea to find “the passage to Mexico”. The gathering on June 4, 1671 at Sault Sainte-Marie is attributed to the influence of Nicolas Perrot on the western tribes. That day, representatives of fourteen nations supported the taking possession in the name of Louis XIV of the territory extending from the northern and western seas to the southern sea, including lands yet to be discovered. On his return to Quebec City at the end of the summer, Daumont de Saint-Lusson called for the seizure of the furs brought back by Perrot. Deprived of resources, the explorer began to feel the pressure of his creditors. His influence on the tribes of the west would once again be sought out by the colony’s leaders. In 1684, he took part in the peace mission of governor Lefebvre de La Barre by recruiting several hundred warriors prepared to wage battle against the Iroquois. He was travelling with them and Daniel Greysolon Dulhut toward Niagara when he learned that, to make peace with the Iroquois, La Barre had sacrificed the western tribes. In 1685, Perrot was made commander in chief of the territory that Daumont de Saint-Lusson had taken possession of fourteen years earlier. Even though his powers were restricted soon afterwards, he accomplished his mission. He maintained the fragile ties that existed between the peoples he knew already and ensured that their furs were reserved for the French. The man the Amerindians called ” Metamiens ” or ” the man with the iron legs ” returned to the colony in the spring of 1688. He had travelled through current-day Minnesota and Wisconsin and north on the Mississippi. At Prairie-du-Chien, in the heart of Sioux country, he built Fort Saint-Antoine. A year later, as France and England were at war, Perrot negotiated with his old allies. He obtained a guarantee that they would not follow the Iroquois in the guerrilla attacks that culminated with the August 4 and 5, 1689 assault on the village of Lachine, on Montreal Island. In a letter dated November 20, 1690 to the minister of the colonies, governor Frontenac wrote that ” Sieur Perrot has acquired, through his long practice and knowledge, the humour, customs and language of the nations, and he has much credit among them.” However, this credit was not much use to Perrot when he was not in the west. The diplomat ended his public life in 1696, but in 1701, he made a final appearance on the diplomatic scene. This time, it was governor Louis-Hector de Callière, appointed on April 20, 1699, who needed his services. Wanting to bring an end to the Franco-Iroquois wars, Callière rallied thirty Amerindian tribes for an accord that guaranteed their neutrality in the event of conflict between France and England. As the interpreter for the western tribes, Perrot played his last public role. The ” Peace of Montreal ” was signed on August 4, 1701, before more than 1,300 Amerindian delegates. The Chief of the Pouteouatamis requested Perrot’s presence among his people to cement the new peace, but his request was refused by Frontenac. In 1671, Nicolas Perrot had married Madeleine Raclos and like many fur traders and coureurs des bois, he settled in the region of Trois-Rivières, living in Champlain and Bécancour where his wife gave birth to eleven children altogether. When he retired in 1696, he was well and truly living in poverty. Those who had needed his services were no longer there. Those now in position refused to recognize the importance of the role he had played free of cost, even going so far as to personally ensure the salaries of his travelling companions. The contempt of the public officials meant that henceforth he was known simply by the expression ” nommé Perrot “. He accepted the position of a captain of the militia in Bécancour. The only favour ever granted him was the separation of his and his wife’s goods to protect his wife and children from a seizure of their possessions. Nicolas Perrot died on August 13, 1717 in Bécancour. He had spent much time in writing a summary of his experiences for the Intendant Michel Bégon. The final lines of his memoirs illustrate the reality of his destitution: “Lack of paper prevents me from going on at greater length, as I would have every right to do so, if I were not deprived of even that modest means. ” Nicolas Perrot’s testimony was not made public until 1864, when it was published in Paris under the title Mémoire sur les moeurs, coustumes et religion des sauvages de l’Amérique Septentrionale.